Hutchesontown/Part Gorbals Comprehensive Development Area was given formal approval by the Secretary of State for Scotland in 1957. This was Glasgow Corporation’s way of disposing of the notorious slum areas of the Gorbals, of ‘No Mean City’ fame, while creating a new ‘modern’ showpiece innercity housing estate, or five to be exact. Hutchesontown as part of the Gorbals had a long history of being associated with crime, vice, poverty, poor health and overcrowding. It’s not surprising that the Corporation started its programme of clearance and rebuilding in this location. Prestigious and well-known architects were awarded contracts to build high rise estates with a ‘modern’ aesthetic, reflecting contemporary architectural fashion and practice. Hutchesontown ‘A’ was low rise housing, mainly maisonettes completed in the late 1950s; Hutchesontown ‘B’ was designed by Robert Mathew and contained four 18 storey blocks; Hutchesontown ‘C’, the most famous of all the areas, was designed by Basil Spence; Hutchesontown ‘D’ was designed by the SSHA’s chief technical officer Harold Buteux and was the largest area and included four 24 storey blocks and three 8 storey blocks; finally, Hutchesontown ‘E’ comprised of twelve 7-storey deck access blocks and two 24 storey point blocks. This layout followed the recommendations of the Bruce Report of 1946 for modernising and replanning the city within its existing boundaries. The Bruce plan hoped to retain the city’s population through high density building. The opposing Abercrombie plan which was regional in outlook argued for a more even distribution of population throughout the Clyde Valley, which meant moving 250,000 to 300,000 people out of Glasgow to ease congestion. The Government, with the support of the Scottish Office, favoured the Abercrombie plan which resulted in the establishment of an ‘overspill programme’ and the building of new towns, of which East Kilbride was the first. 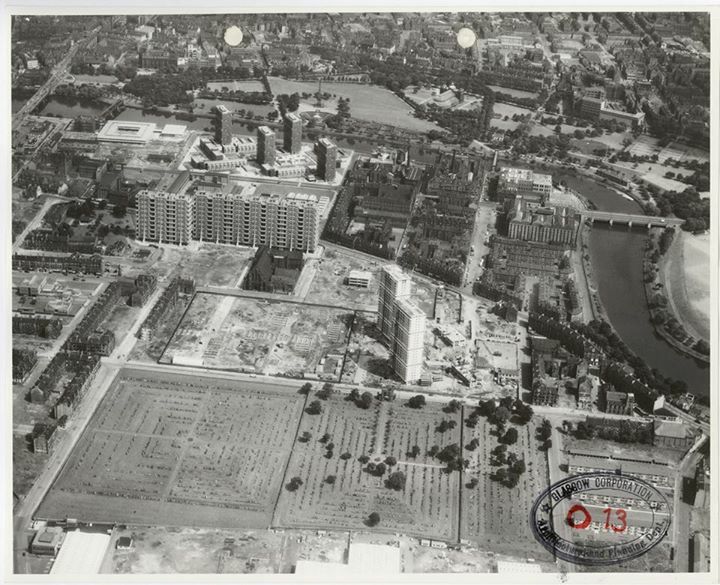 However Glasgow Corporation went ahead with its plan to retain its population through high density building and the Government approved Hutchesontown/Part Gorbals as a pilot CDA programme in 1954. The Corporation wanted to adopt a similar approach in Royston and Govan. Glasgow Corporation was to designate 29 CDAs, of varying sizes, throughout the city, the most comprehensive use of this redevelopment strategy in the UK (although not all of these plans were fully realised). There seems to have been much excitement within Scotland’s architectural community concerning the planned Hutchesontown/Part Gorbals CDA. Ninian Johnstone, a prominent Glasgow based architect, wrote an article entitled ‘Miracle in the Gorbals?’ (after the ballet of 1944 of the same name?) in Architectural Prospect, which described the CDA as ‘the largest of its kind so far attempted’ and ‘one which bids fair to make history’. 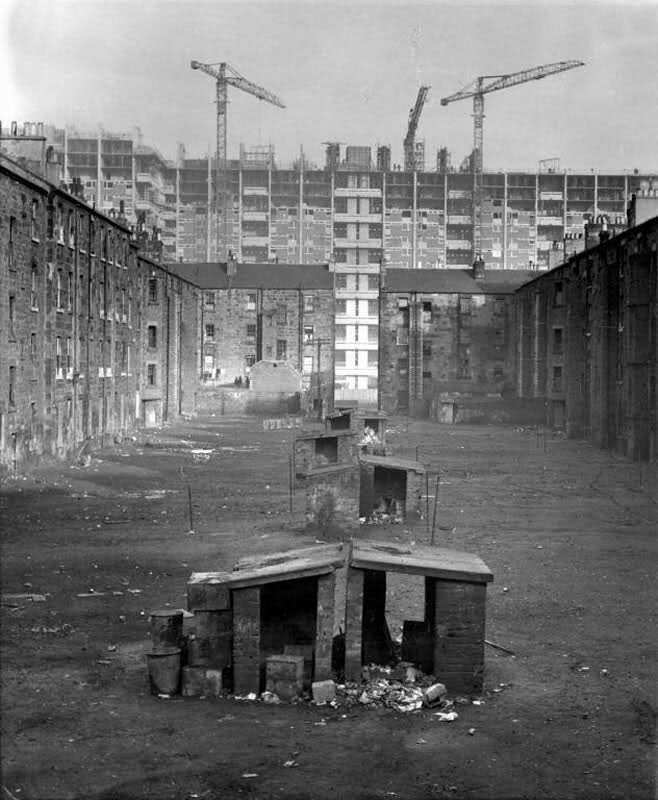 Hutchesontown/Part Gorbals comprised at the planning stage 111 acres of ground on the south bank of the Clyde between Crown Street to the west, Waddel Street to the east and Caledonia Road to the south. Much of the four storey tenements that would be cleared only dated from around 1850 to 1890 and Johnston described it as an area which had ‘deteriorated rapidly’. Industry was described as being ‘unimportant’ in the area with only 11.7 acres occupied by small concerns. Notably there were 394 occupied shops (50 unoccupied), 48 public houses and other community facilities. It was expected that development of the area would take twenty years and in the first stage a main shopping centre, clinic, cinema and ‘services trades area’ would be built. Stages two and three would include the schools and the completion of local shopping centres and a community centre. There was to be 57 shops replacing the 444 existing in 1957. The 48 pubs were to be reduced to 9. Industry would not be relocated in the area but sites would be made available in areas zoned for industrial use for those firms displaced. In terms of the proposed layout, the main objective was to eliminate through traffic and ‘create an integrated plan’. There were to be small parks to act as central open spaces, with playgrounds and nursery schools included for the same reasons. Johnston in true architectural fashion also stated that ‘the development will also have a very important effect on Glasgow’s skyline’. The plan to build several point blocks and slab blocks was welcomed as ‘at present’ Glasgow has ‘generally the rather dull effect of having been chopped off four storeys above ground level, so that the impression is gained of proceeding along a series of gigantic trenches’. The new development would also ‘give back to use the space which is stolen by Glasgow’s countless back courts’. It was expected that the total cost of acquisition, demolition and development would be almost £13m (approx £284m today). Undoubtedly the final cost would have been higher. 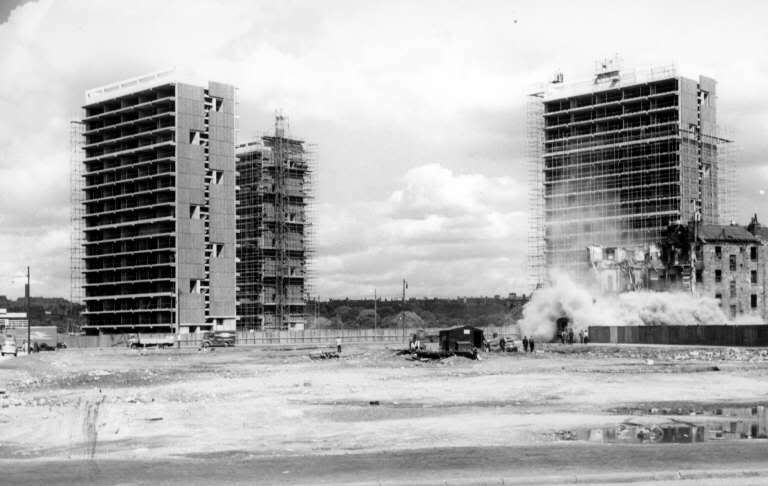 The Spence blocks at Queen Elizabeth Square, for example, suffered both from construction delays and went over budget. 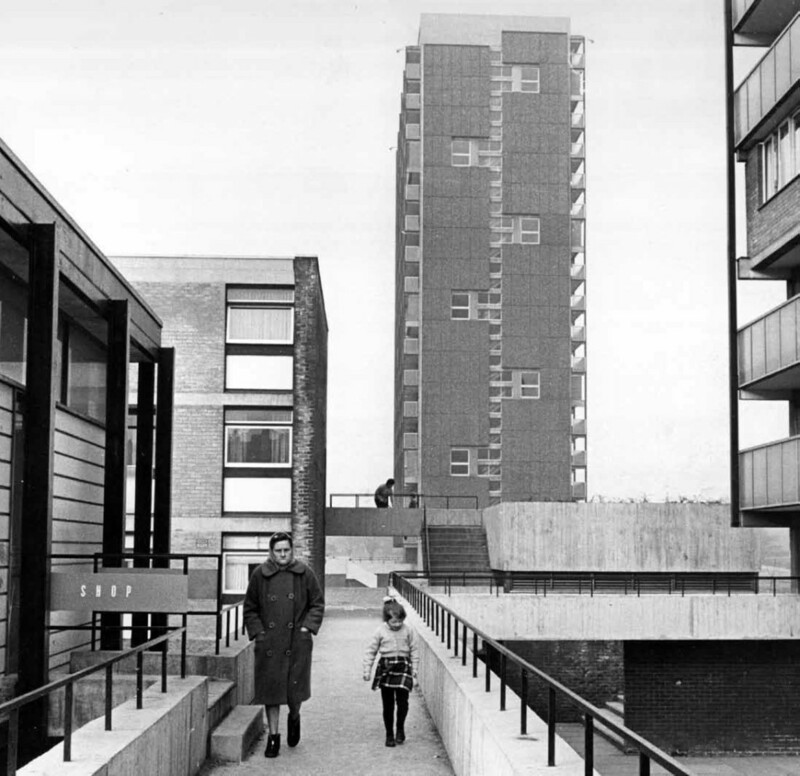 We have chosen to focus on Hutchesontown ‘C’, the blocks designed by Basil Spence, mainly because his buildings were nationally, if not internationally, renowned at the time they were built. 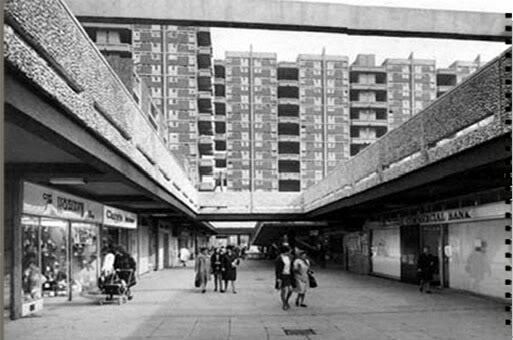 The design was obviously influenced by Le Corbusier and thus Hutchesontown ‘C’ was a good example of ‘modernist’ architecture popular in the1960s. It was also hailed as a good example of ‘brutalist’ architecture, which has had a revival in recent years in terms of its popularity in architectural circles. 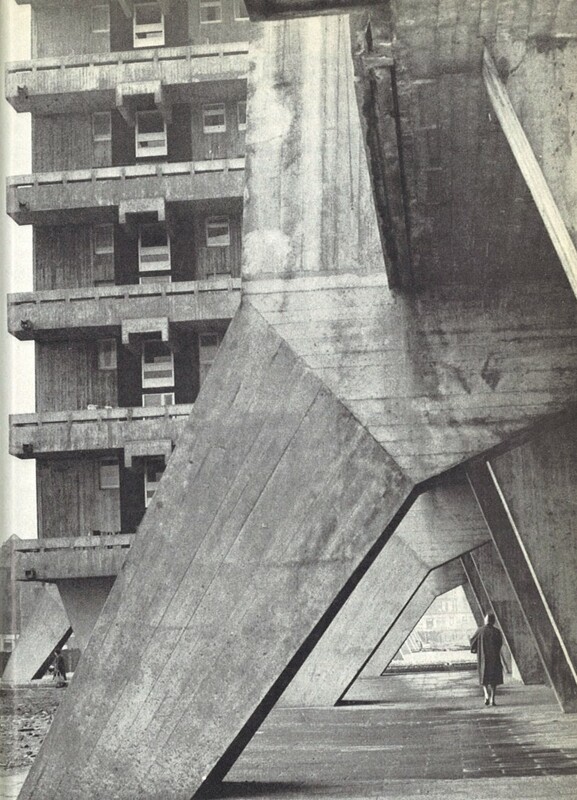 See for example 'Scottish Brutalism' a University of Strathclyde Department of Architecture research project which aims to map, document and critically assess Brutalist architecture across the Strathclyde region. However ‘modernism’ soon became unpopular in the 1970s and suffered a back-lash, with ‘post-modern’ architecture becoming the new movement in the 1980s. The Spence blocks even had a ‘post-modern’ makeover in the 1980s when the architectural equivalent of pointy hats were constructed on top of the building. The job architect, Charles Robertson, discussing the blocks at a conference in 1992 (see Miles Glendinning, Rebuilding Scotland: The Postwar Vision 1945-1975 (East Linton: Tuckwell Press, 1997), pp. 92-102), stated that Spence’s brief was to build three slab blocks. He was required to build 400 individual dwellings, of five different types. Lifts were to stop on alternate floors in order to be more ‘economic’ – hence the reason why the houses were maisonettes. Robertson describes the slabs as being ‘composed, in effect, of ten individual “towers’ each 40 feet square’. They were linked by communal balconies or ‘garden slabs’. These balconies were seen as ‘a perpetuation of the green’ and as ‘a space for some tubs of flowers, and to hang out the washing, to give the baby an airing, and to provide a garden fence to gossip over’. Like Le Corbusier’s Unité d’Habitation (see our blog 'Glasgow goes to Marseilles') Spence’s blocks were also on stilts, which was supposed to allow the space under the building to be used by the community. However what the Spence blocks lacked were the inbuilt recreation, shopping and educational facilities which Le Corbusier’s block had. ‘What we did not realise when we were building things of this nature is that they involve a very high maintenance cost. And that cost was impossible for the local authority to deal with’ (p. 101). Hutchesontown ‘C’ was demolished in 1993. People were, and continue to be, vociferously divided over the merits and failures of the blocks, regardless of whether they themselves lived in them or not. 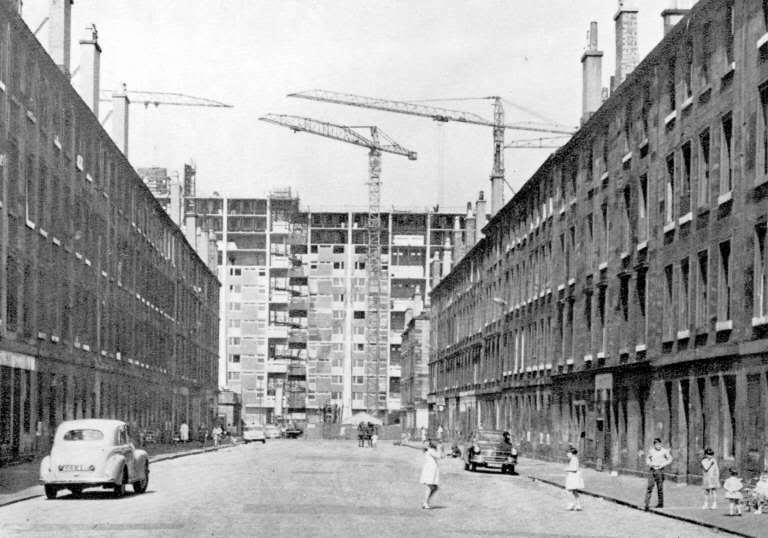 See for example 'The Gorbals Block debate' on 'The Joy of Concrete' website. Or the opinions of residents and architectural experts etc in a BBC documentary 'High Rise and Fall' from 1993. The blocks by Robert Mathew, now known as the Riverside Estate are also interesting in that all four of the blocks and the low rise flats that accompanied them are the only part of the Hutchesontown/Part Gorbals CDA which has survived fairly intact. Having received a £6million refurbishment which was completed in 2008, these high flats are considered to be fairly popular. Mathew was a leading figure in the architectural profession when his firm was awarded the contract, he had designed the redevelopment of the University of Edinburgh's George Square and the Tower Building at the University of Dundee. He insisted that the blocks at Hutchesontown 'B' be build at 45 degree angles to the road plan as this was best for maximising daylight. 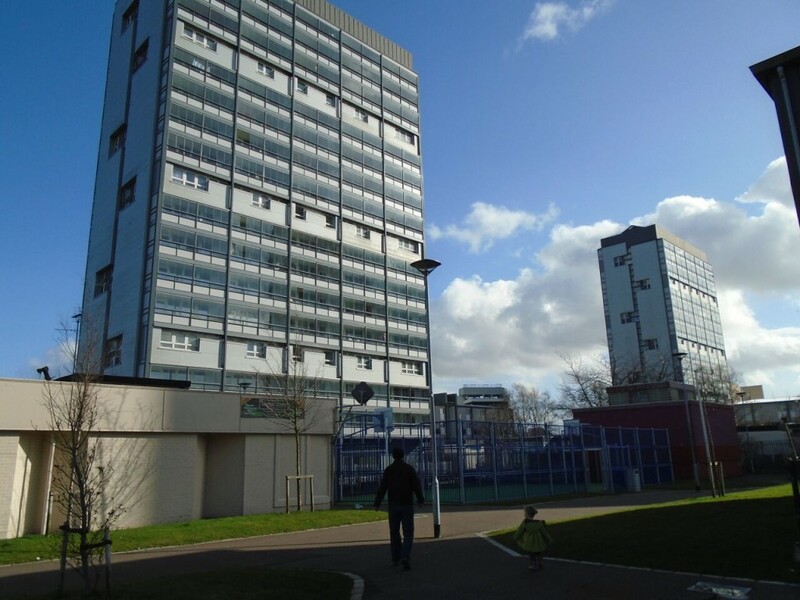 Like Queen Elizabeth Square, the flats were built over two levels, maisonettes, with the lifts stopping on alternate floors. All flats had balconies. Mathew also pioneered the lighting of the roof space, which he described as 'public theatre', that many blocks in Glasgow now have. Waddel and Commercial Courts do not seem to have divided opinion in the same way as Queen Elizabeth Square. The design and construction was more straightforward, perhaps there has been less problems with water ingress and damp. Some material on this webiste is not being made available under the terms of this licence. Third-Party materials that is being used under fair use or with permission (photography owned by archives, blog contributors or from WikiMedia Commons). The respective copyright/Creative Commons licence details for use of third-party material should be consulted.